Here are a selection of photos from my trip to Ho Chi Minh City, along with a few that were taken in the days before the trip while we had several guests in town. Notes and impressions from the Saigon trip are in two brief entries: Part 1 here and Part 2 here. 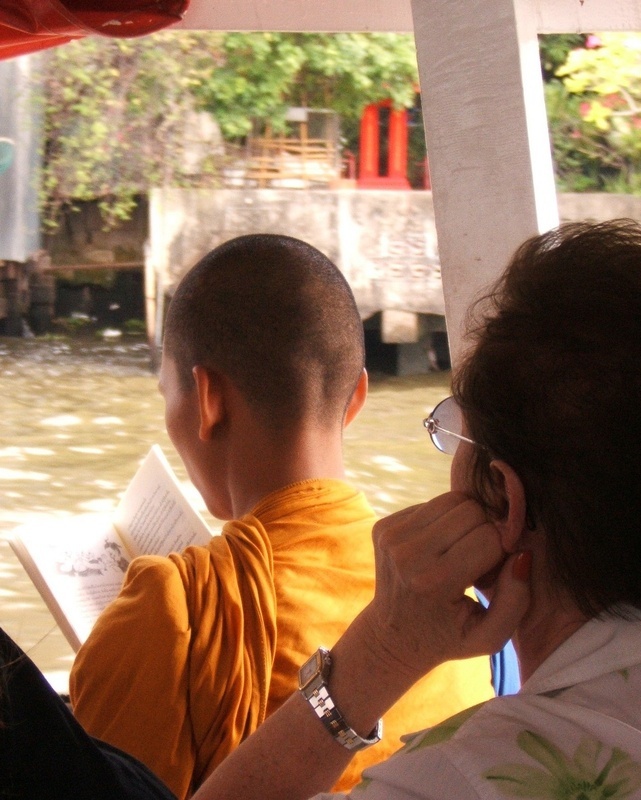 A Buddhist monk reads a book while riding the Chao Praya river taxi in Thailand. 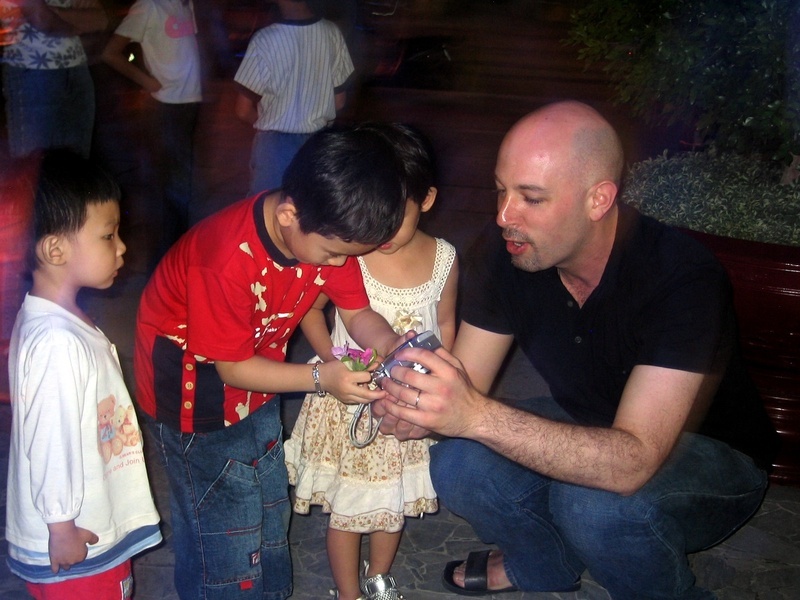 A farang tourist stands behind him. The taxis run up and down the river like a boat, stopping a designated piers. Conductors onboard carry a metal cylinder containing coins and receipts, just like on the Bangkok buses. Because of their prohibition from touching or being touched by women, monks have a reserved space at the back of the boat where they can stand. 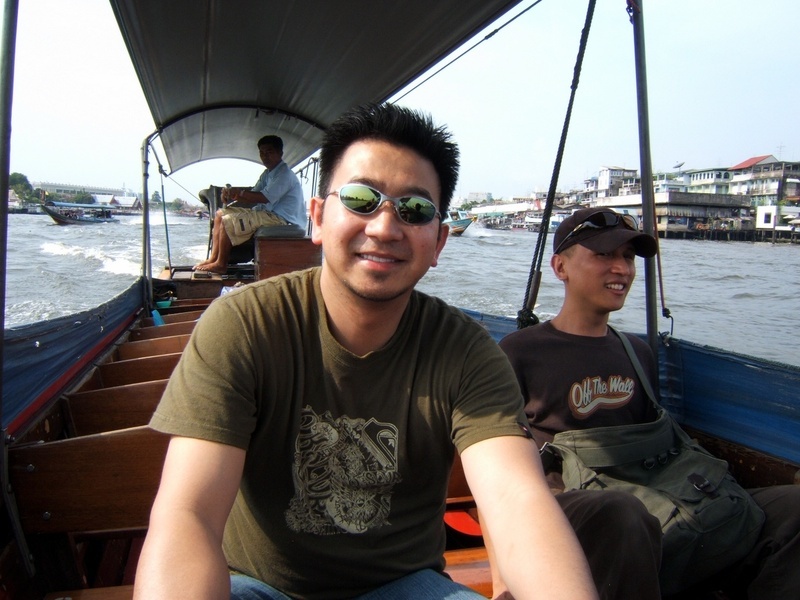 Ryan and Tod riding in the long-tail boat we hired to get us back down the Chao Praya in record time. A normal river taxi would have been 30 minutes; the long-tail boat got us there in 10 and afforded us an excellent view. We were bouncing along the water so fast that we could have water skiied behind. 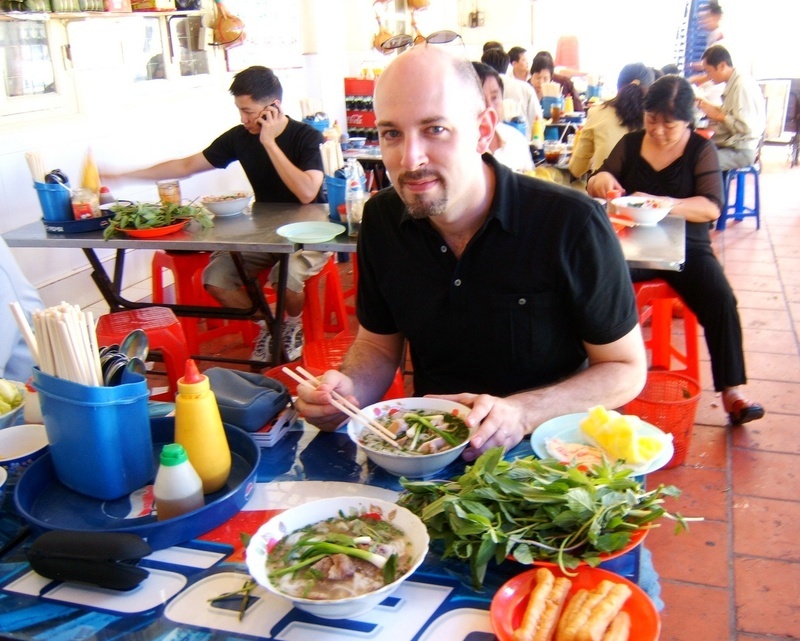 Chris eating pho – beef noodle soup – the afternoon of our arrival in Ho Chi Minh City. Tawn had to complete a press release for work, so he stayed at the hotel and Ryan and I started exploring nearby. Just a few blocks away we ran into a pho shop on the corner and enjoyed two bowls of soup and two bottles of water for only 30,000 Dong – about US$2.00. 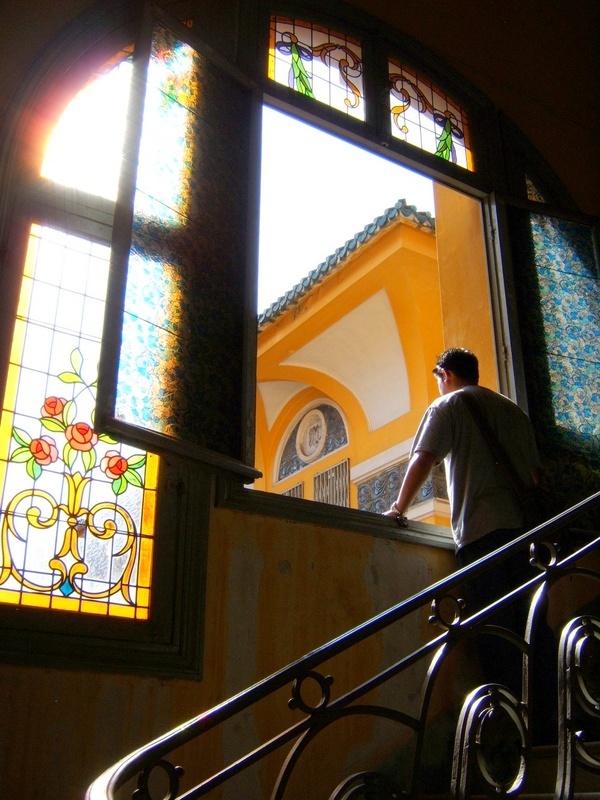 Ryan posing at the impressive stained glass windows at the Italian villa-style Fine Arts Museum in Ho Chi Minh City. While most of the art was limited to certain political themes, a wide range of styles and skills were demonstrated. 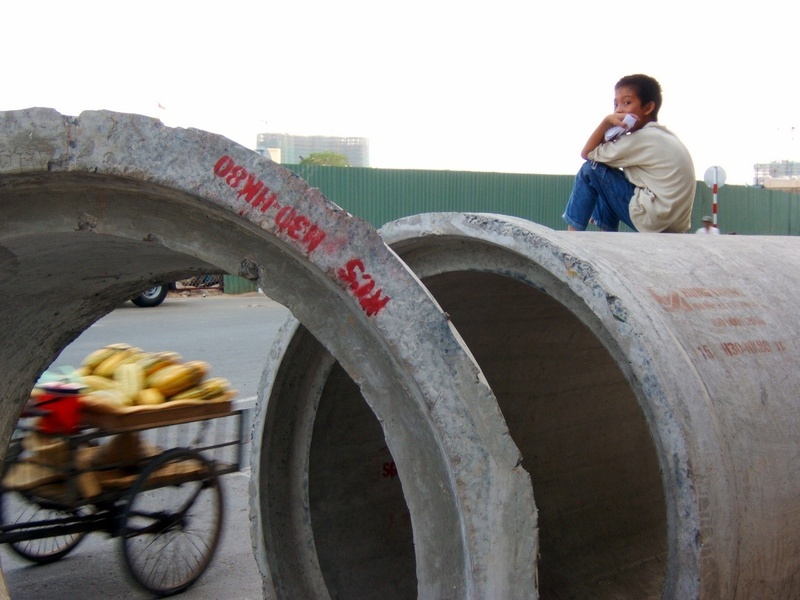 A young man sits atop a soon-to-be-installed sewer pipe along the waterfront in Ho Chi Minh City. Young people were the optimistic face of the future and we regularly encountered children who wanted to talk with us or be in our pictures. Young lovers along the riverfront shortly after sunset. Young couples have little privacy as most live with their families until marriage (and often afterwards, too), so they seek out private time in very public places. The main parks were also quite busy in the evenings as couples perched on motor bike seats, talking and just holding each other – a rare public display of affection. Outside the Reunification Palace, Tawn is mobbed by a group of school children who are eager to be photographed. Reunification Palace was formerly the Presidential Palace and it is preserved almost exactly as it was on April 30, 1975 when North Vietnamese tanks crashed through the main gates (those two tanks are still parked on the lawn outside the building) and the South Vietnamese government finally fell. Tawn takes a turn grilling dinner at a popular outdoor restaurant. Our half-kilo of fresh shrimp arrived in a plastic grocery bag, still kicking. The waiter showed us how to snap their main nerve with a toothpick before throwing them on the grill to cook, otherwise they’d squirm and jump off the grill. Much of Ho Chi Minh City’s commerce takes place on the streets. 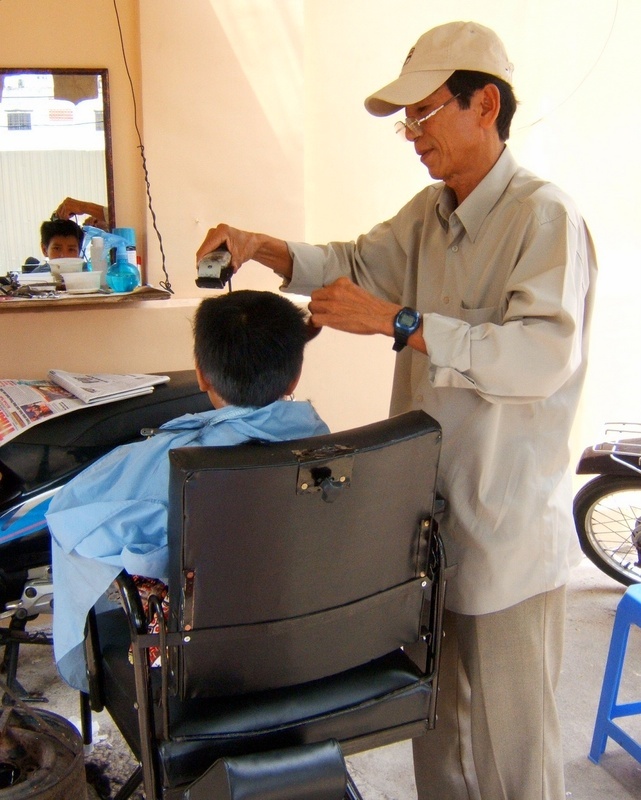 Here, a barber has set up shop next to a wall, hanging a tarp overhead for shade and using a vintage barbershop chair. His young customer shows some trepidation about getting what turns out to be a very short haircut. People everywhere were very friendly and happy to pose for photographs. Motorbikes were ubiquitous in HCMC. What was most surprising was the number of people they carried. 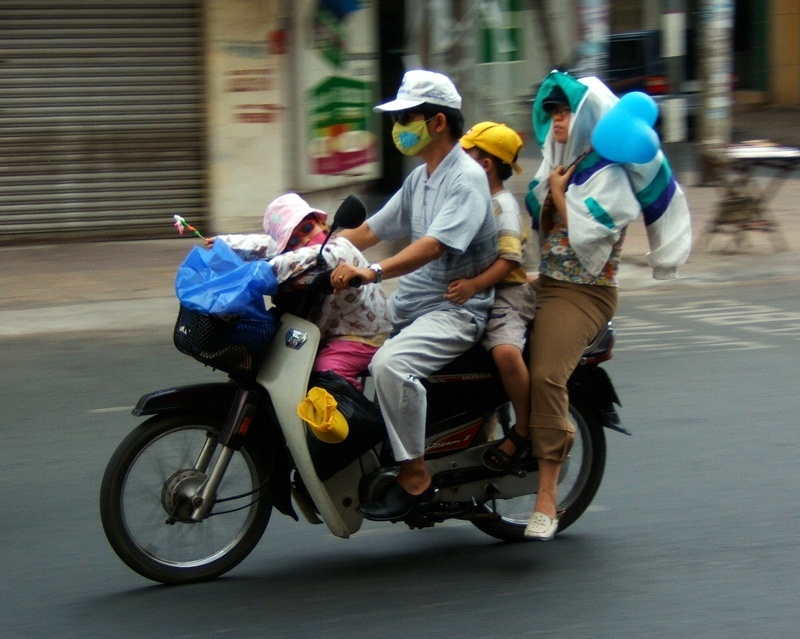 Carpooling (for lack of a beter word) is the norm, and it wasn’t unusual to see an entire family riding one bike. The album link below has more photos of groups on motorbikes. One of the things that most sparked Ryan’s childhood memories was the flavors of his childhood. Here, we stop for fresh-pressed sugar cane juice, available from vendors thorughout the city. 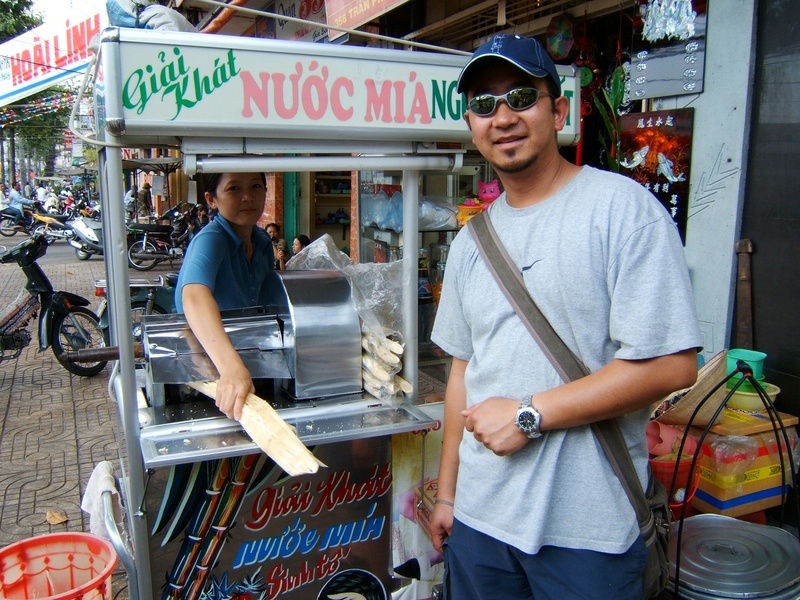 Ryan said that the sugar cane juice in Viet Nam tastes different from that he’s had elsewhere in the world. Sunday evening I was taking time-exposure pictures of the Hotel de Ville, the Communist Party headquarters. There were many families strolling about and as I took the pictures, several youngsters came over to see what I was doing. One in particular, about five years old, was very keen to help take the pictures. Between a combination of gestures I showed him what button to push and he took this second picture of another boy and his father standing in front of the Hotel de Ville. When I asked if he wanted me to take a picture of him and his sister, he looked at me with all seriousness and said, “no, thank you.” So we continued taking pictures. 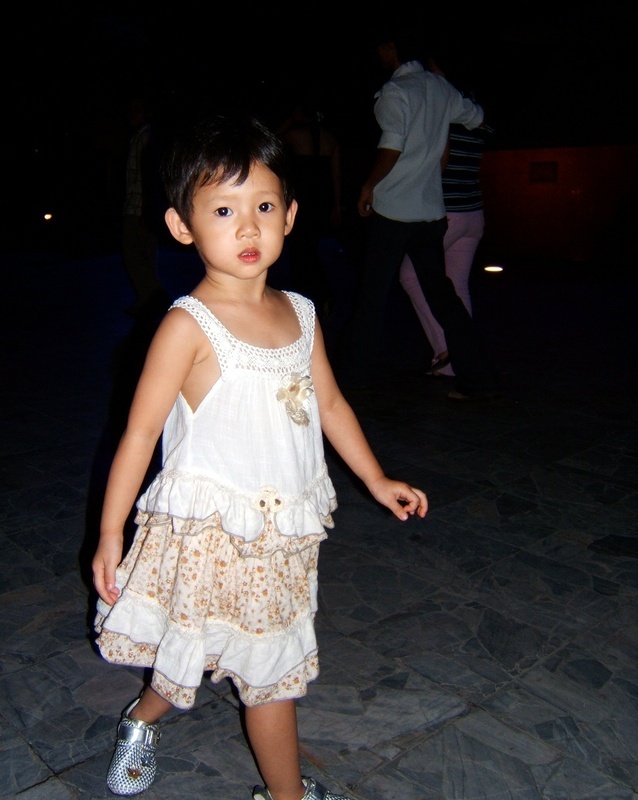 His sister, unable to get a chance to try because of her brother’s enthusiasm, wandered off in front of the camera. I turned on the flash and had her brother snap another picture; his sister was surprised by the flash and came running over to see what happened. Once the picture appeared on screen they both squealed with delight, and then the young boy decided he, too, wanted his picture taken. Afterwards, I asked the father whether they had an email address so I could send the pictures to them. Unfortunately, they have “no computer” and it didn’t occur to me to get a mail address so I could print out the photos and send them to the family. If anyone reading this knows anyone in Ho Chi Minh City, send the link to them and maybe we can track these children down! 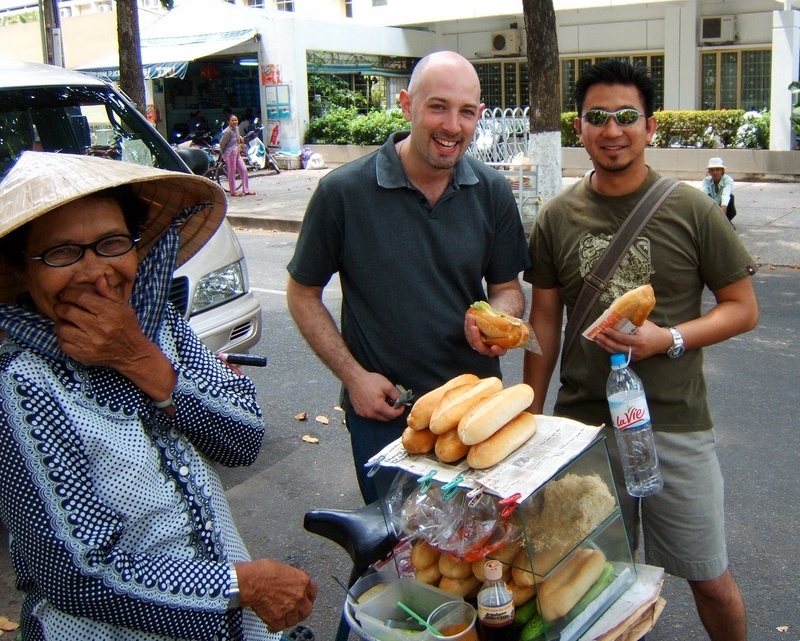 Ryan and I with a vendor who sells Vietnamese sandwiches. The rolls and pate fillings are undoubtedly influenced by the French, and provided another flavor memorie for Ryan. He went back for a second sandwich a few minutes later. The vendor spoke English well and kept insisting that we would make her very happy if we bought a third sandwich from her. 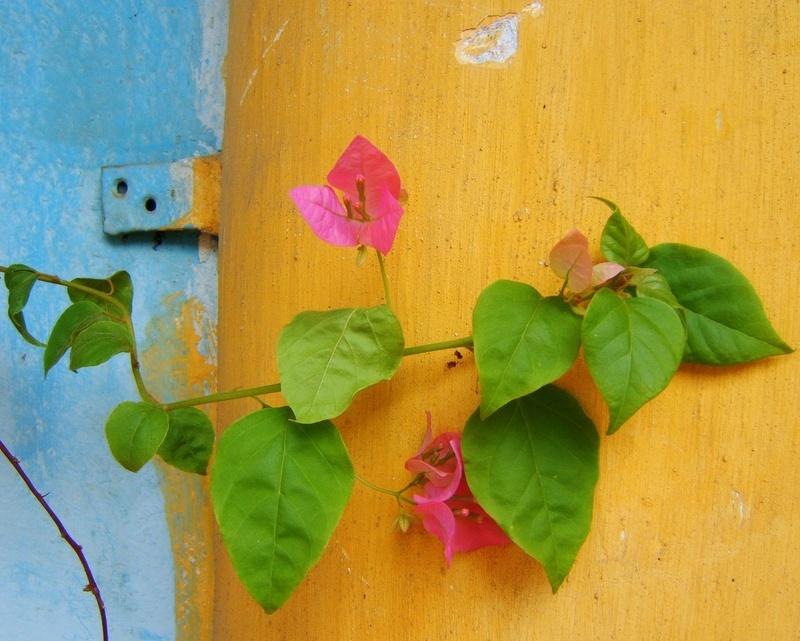 Flowers at the Marriaman Hindu Temple – the only Hindu temple in HCMC serving a Hindu population estimated at about 60 people. It is also considered an auspicious site for other religions, though. We visited one afternoon around sunset and again the next day, captivated by the brilliant colors. When we returned to the temple the next day, a young lady and her toddler were playing at the front entrance. The toddler was very outgoing, throwing a pen at me and then coming over and hugging my legs. Later, he was playing with blocks on the tile floor and smiled for this picture. His mother had him running around without a diaper, so I wanted to be careful to avoid taking any pictures that could be misinterpreted by any suspicious authorities. 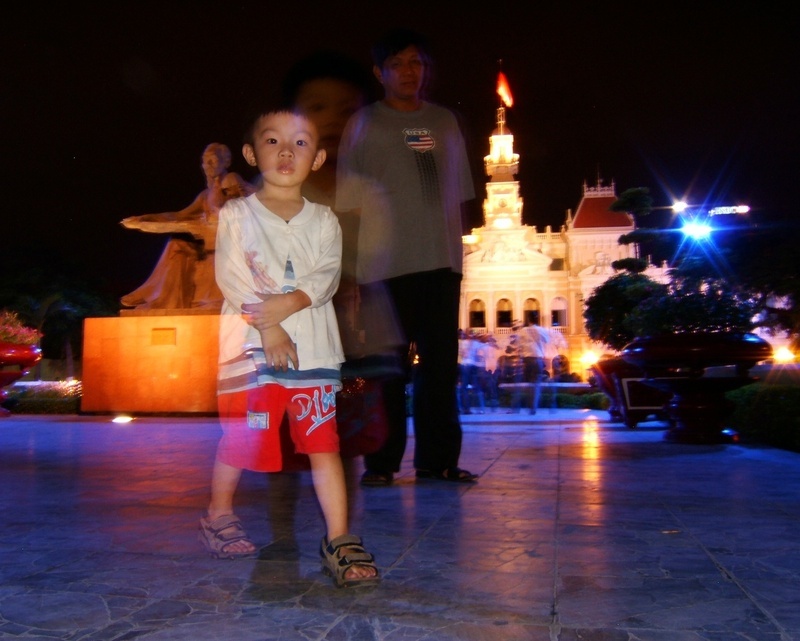 This entry was posted in Uncategorized and tagged HCMC, Ho Chi Minh City, Saigon, travel, Vietnam by christao408. Bookmark the permalink. The picture in black and white took me by surprise. Like it was taken in a different world. And the one under the title “making friends” is adorable. Excellent pictures. Thank you for sharing! I want pho and banh mi now lol. And the shrimp thing is very interesting! @nov_way – Thanks so much; yes, that shot of the couple by the river was one of those moments where when I saw the setting, I immediately recognized that there was a great picture to be taken. In the end, I shot some 40 or so frames and this was the one I liked best. In my mind, it captures exactly the mood of the moment. @Devilzgaysianboi – Aren’t they adorable? This was when digital cameras were still a relative novelty and so they seemed really excited to be able to see the picture right after it was taken. 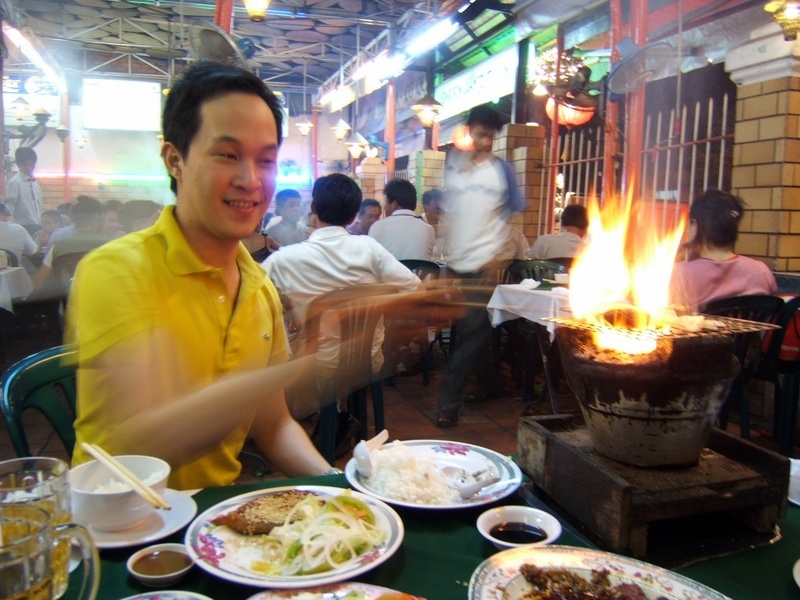 @hilabpartnerxD – Vietnamese food is just great. One of my favorites. @Ikwa – I can understand how pho might be an acquired taste for some folks. No worries – that just means more for the rest of us! Interesting side story about the K-drama. Thai soaps are loosely based on the same style, lots of over-to-top behavior by the characters. @murisopsis – It really was and traveling there with my friend Ryan, whose family had escaped from Saigon in ’75, was a particular honor. Beautiful pictures. Tremendous vacation into a historic land. I have read about the Hotel de Ville in The Lotus Eaters I believe. @ZSA_MD – By “The Lotus Eaters,” I assume you mean the poem by Alfred Tennyson and not the 80s English pop band? the food looks absolutely AMAZING!!! I love the pictures!!! @faustuosa – Glad you enjoyed it. Belated happy birthday, by the way! 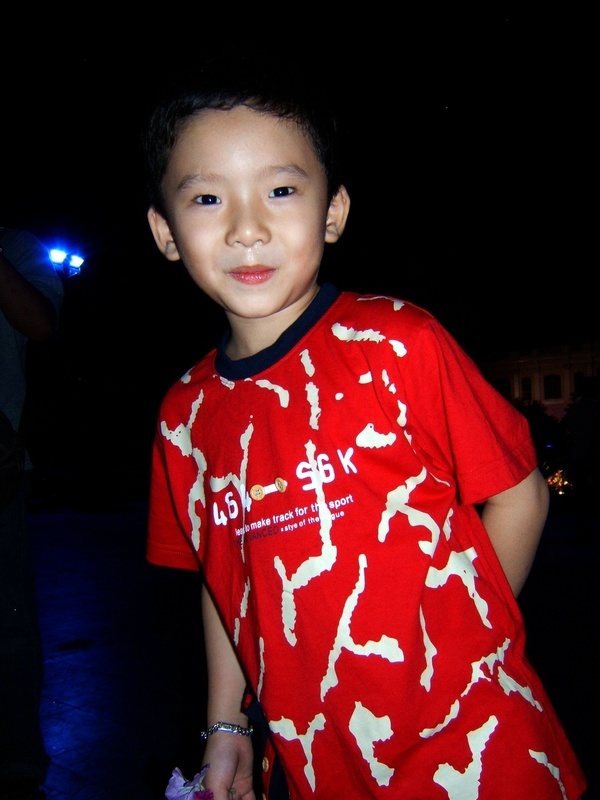 @christao408 – @christao408 – not belated, TODAY is my BDAY! April 9. 😀 THANKS!!!! I want to go to Ho Chi Minh City. @Ricardo98 – It is a fascinating city.